Creating awesome business cards can give your company a fresh new look! Make an impact the first time someone receives your business card. 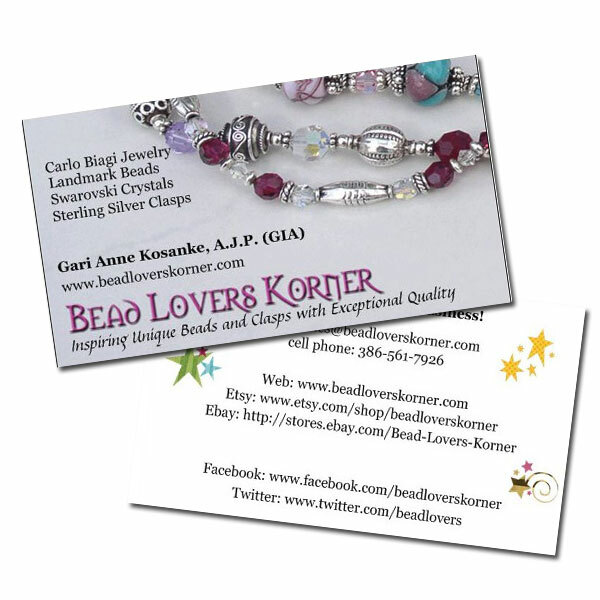 Bead Lovers Korner launched a new website last year, with a new banner and color scheme, but the business cards remained the same old cards. I spent a small fortune on the new website and updated the Etsy Shop and Ebay Store to match the website look, but never updated the business cards. Silly huh? It was just too easy to hit reorder at Vista Print and keep using the same old cards. Not being a graphic designer (I only know enough to be dangerous) attempting to update the business cards was something I needed to have done by a professional. Procrastination could have been my middle name, because I just kept reordering the same old business cards. This year I was accepted into The Artisan Group and will be participating in events as well as selling online. I wanted my cards to match the new web design and really make an impact so that if a celebrity or influential person happened to see my card they might take notice and not just throw it in the trash. I finally broke down and hired a friend who is a Professional Graphic Artist to design awesome new business cards for Bead Lovers Korner. Jennifer Remias and I worked together for many years at a Catalog Publishing business, she was the Senior Graphic Designer and very talented in her trade. I contacted her to see if she would help me with the update to my cards. She did an awesome job with the design of these NEW cards and they will be rolling out this summer! p.s. She gave me print ready pdfs and now I hit reorder at Overnight Prints, who also has great pricing.